Adeyinka Mafe, Majority Leader of the Ogun State House of Assembly, has defected from the Allied Peoples Movement (APM) to the All Progressives Congress (APC). APM is the party with which Ibikunle Amosun, Governor of Ogun State, attempted to actualise the governorship ambition of Adekunle Akinlade, who failed to secure the ticket of the ruling party. Mafe, who represents Sagamu 1 State Constituency in the Assembly, resigned from the APC alongside three other lawmakers in November 2018 to join Amosun’s APM. However, with Akinlade having lost the election and Amosun even facing expulsion threats from the APC, Mafe has now returned to his original party. “I had earlier written a letter to leave APC. 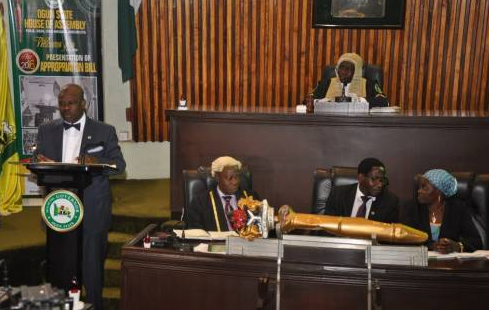 I write to officially withdraw the letter and I wish to notify you that I remain a member of APC Next Level,” he said in a letter of withdrawal read at plenary by the Speaker of the assembly, Suraj Adekunbi. It is yet unclear if the three officers who joined APM with Mafe — Idowu Olowofuja, the Chief Whip (Abeokuta South II); Ganiyu Oyedeji (Ifo II) and Tunde Sanusi (Obafemi Owode) — will return to the APC as well.